This concession owner approached us in 2017, having heard from some of our PH’s, that we here at Hunt-Nation specialize in African Safaris and adventures. Since then our clients have been glowing in their reports on just how good this operation is. Said one well-traveled hunter: “Butch, this place is just too nice for hunters! Like staying on a luxury cruise ship. I give it excellent in every single category from guides to game to lodging and meals!” Tom M.
The Hunting Manager started hunting with his father on his grandfather’s cattle farm in the Limpopo Region, close to the Botswana border. 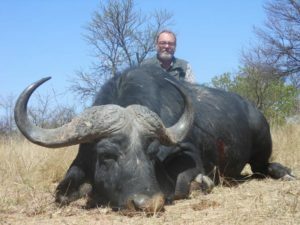 In the many years since then, he has been hunting much of South Africa as well as many other African countries. After he finished school in 1985, he joined the South African Police Force as part of his military training. He worked 30 years as a detective in the Limpopo Province, and specialized in the investigation of game and cattle theft. Because of that extensive background, he knows the area like no other man alive, and has an extensive field of contacts. In 2000, he decided he wanted to become a Professional Hunter, and since then he has been hunting with clients from around the world. He was very excited to work with us in promoting to the North American market. Their camp is very nice indeed, and is located in a great area far from cities and public traffic or noise. The staff is extremely friendly and very service minded and in the hunters lodge you have your own chef and waiters plus a barman just waiting for you next order. The accommodation is luxurious, and I got the Klipspringer suite, which is a higher standard than the basic one. You have great beds, a walk in huge bath and a terrace with a view to the animal park and swimming pool. The food will be served under the fantastic black velvet African sky with a view to a milky way I have never seen so clearly before. The PH’s are very professional. Most of them are x-cops with long experience. They know their job and will adapt to any form of hunting you prefer. I like to walk and ‘work’ for my game hard; others prefer to drive and then stalk from the car. All is possible, you just need to tell them what you prefer. 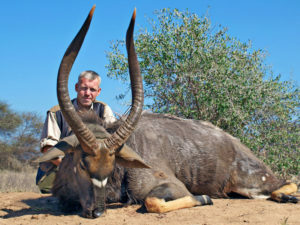 “I shot Impala, Kudu, Warthog, Bushbuck, Blesbuck, Nyala and klipspringer. All medal, most gold and silver. 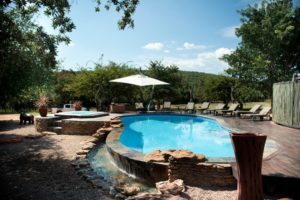 Their own Private Reserve is the starting point of your hunt, and is located in the middle of the beautiful Waterberg Mountains in the Limpopo region. The area is scenic, and is considered to be a malaria free area. Over the last 20 years, the Company efforts have transformed this area into a superb wildlife reserve containing three of South Africa’s most luxurious lodges. The lodges are an oasis in the middle of the Mountains. Located directly in the malaria free, UNESCO protected ‘Biosphere Reserve’ that is the Waterberg Mountains, 149 miles north of Pretoria. This area is one of only 93 ‘Biosphere Reserve’ locations in the world, which means the area is under complete environmental protection. It also is adjacent to the Velgewonden Big 5 Area (where the Big Five can be seen), and only a short drive from well known Pilansberg National Park, allowing great touring opportunities. In addition, the PH has around 500,000 acres of “Bushland” hunting concessions that he operates on, affording you a huge variety of species and terrain. This 5-star lodge has its own full-service facilities such as a large dipping pool for guests, sun beds and towels, a lounge area, a bar area, an outdoor grill and a large kitchen where all your meals will be prepared. The wine cellar is incredible! Companions who stay behind have many choices – see the itinerary proposed below; lots to do here. When the day’s hunt is over and the darkness gathers, everyone meets around the fireplace (“lapa”) within the traditional “boma” (enclosure) and tells “slightly” exaggerated hunting stories in a relaxed atmosphere while enjoying your choice of beverage, served by a barman. The personal chef will spoil you with high-end quality and exciting menus. Bartenders will customarily be ready from noon until the last guest goes to bed at night. Housekeeping will come by every day to clean your room as well as the common areas. Unfortunately, they are unable to offer laundry service for hunting parties who spend less than six days at Elephant Lodge hunting. They went out of their way to do everything to make my trip enjoyable. They upgraded me to a suite for the entire trip for free, provided a private driver both pick up and return to the airport, and everything was first class. I am very pleased with the trip. I hunted one particular warthog and one particular waterbuck. I was unsuccessful with both of those, but it made for a better hunt. I am very pleased with the four gold medal animals taken. I would return for another hunt without hesitation. 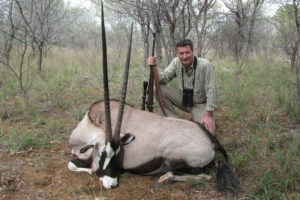 I am attaching photos of my sable, wildebeest and 2 impala. The trips are tailored depending on the species you want to hunt and whether you want to hunt with a rifle or a bow. Bow Hunting should be conducted in dry periods – mainly from June to September and full moon periods should be avoided. The vast majority of South African game species are found in the Bushland, and over the years this PH has built a strong relationship with neighboring landowners, fully utilizing all of the hunting possibilities in the surrounding area. The area is enormous and has a varied biodiversity. This means you usually have to drive to the surrounding hunting areas. The daily driving distance entirely depends on the species you wish to hunt, but most of the hunting is within a 30 minute drive. 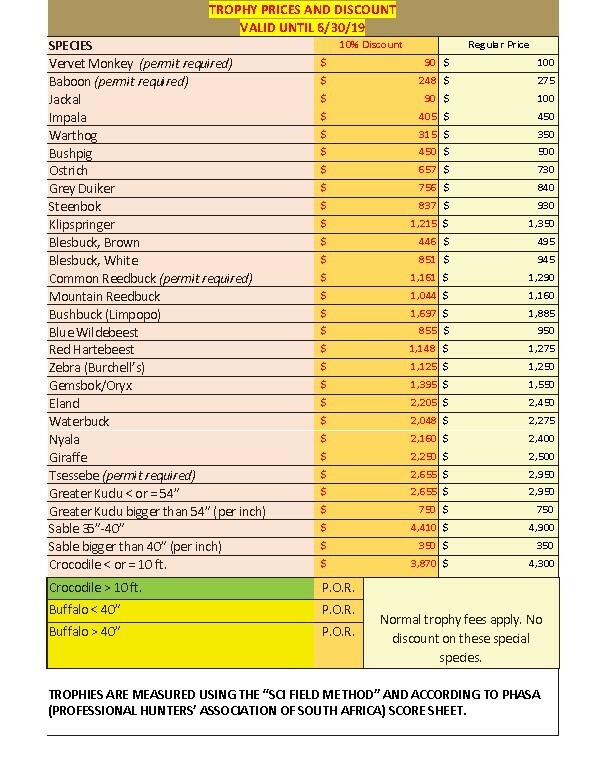 As to sizes, in 2017 they scored 273 animals per SCI rules. Scores on these were 152 Gold, 87 Silver and 34 Bronze! 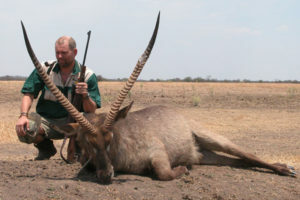 The hunting is usually done as a mix of driving in open safari jeeps to find the game, and then stalking – depending very much on your endurance and preferences. These arrangements are done in close coordination with your PH (Professional Hunter) who always accompanies you during the hunt, and is there solely to assist and help in any way possible. Furthermore you will be accompanied by highly qualified Trackers that can find even the smallest of tracks left behind. A typical day starts early, at around 5.30, with a big continental breakfast prepared by The Elephant Lodges personal chef, living up to all western standards. Followed by a quick drive to your designated hunting area where you, together with your PH and Tracker will start your hunt. As the heat starts to rise, and the animals stop being active and go into hiding, it’s time for a mid-day break. You either drive back to the Lodge, or you rest under a three whilst lunch is prepared. There are plenty of soft drinks, beer and water under the hunt. After an energizing meal and well deserved break you start up again, and continue until sunset – or when you wish to return to The Elephant Lodge. All of this is arranged in close and ongoing coordination with your PH. So if you at any point want to stop for the day, or otherwise have any preferences, this is your prerogative. The staff is obliged to serve your every need, and if you want to hunt all day, or if you are lucky and shot your prey before noon and want to relax by the pool, this is totally up to you. We are solely here to give you the best conditions to have an amazing hunting experience. And you simply won’t find better hunting conditions for hunting in South Africa. The Lodge was finished in June 2009 and is designed in an African architectural style with beautiful animal carvings in the pillars and furniture – blending perfectly together with its surroundings. In each room you will find specially imported beds and duvets guaranteeing your sleeping pleasure after a long day of hunting. You will have all the high-end modern facilities you may need. But we have consciously omitted modern electronic gadgets like TV’s and internet (WI-FI is available at the bar) in your rooms as we wish to create the best starting point for a relaxing and energizing vacation. Furthermore you will find fans/air-condition, a safety box and adaptors for European and American plugs in each room. Twin beds; table and 2 chairs; En-suite bathroom with toilet and shower and e washbasin on top of a base unit; Ventilation fan with different speeds;2 closets and 2 shelves; Safety box and a hairdryer. 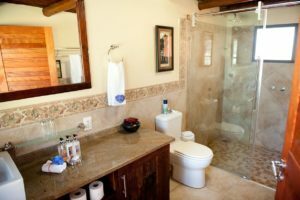 One master bedroom with twin beds; Walk-in closet; Large bathroom with two water basins, shower and bathtub; One bedroom with twin beds; Wall closet; Bathroom with toilet and shower; Two safety boxes; Two hairdryers; Ventilation fans in every room; Fully functional kitchen with Refrigerator, kettle for coffee and tea;. This tour is for the individual who would like more than just the hunting experience and wishes to bring a companion (a non-hunter). 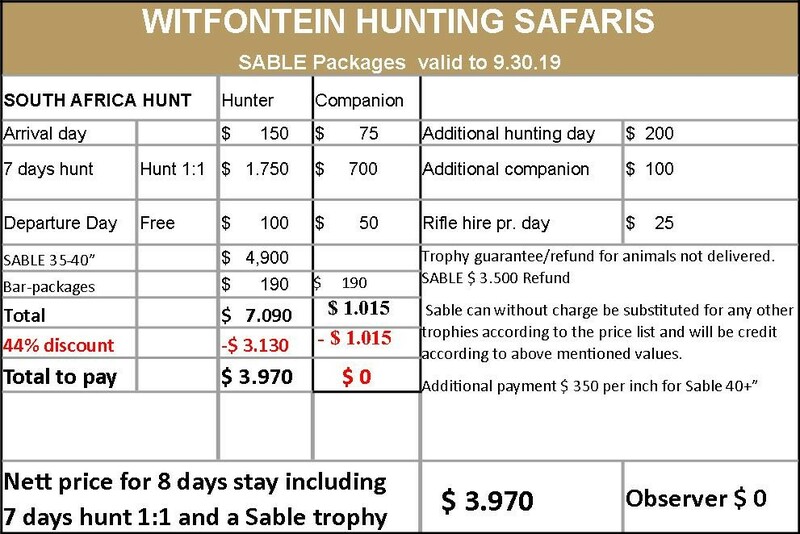 Below are the hunting packages currently offered (subject to availability). These represent an outstanding value. Not only do the packages include nearly all hunting and associated costs, but they also include a FREE observer/non-hunting companion! 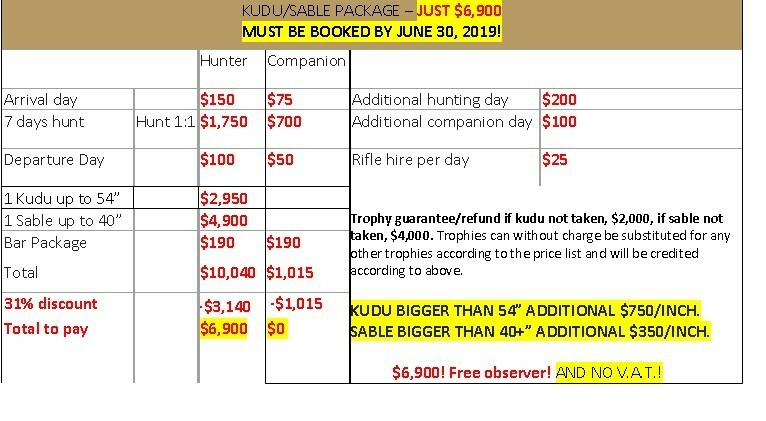 And if that companion sees an animal they’d really like to harvest, they can do so by paying only minor associated admin fees (about $100) and the applicable trophy fee. There’s no charge for upgrading from “non-hunter” to “hunter”. And if that doesn’t sound good enough already, they also don’t charge Value Added Tax (“V.A.T.”) on hunts or taxidermy fees. That means a 15% savings over just about every other outfitter in South Africa, all else being equal. We just don’t think you can beat that anywhere! A HIGH QUALITY SAFARI FOR ONLY $2,625! 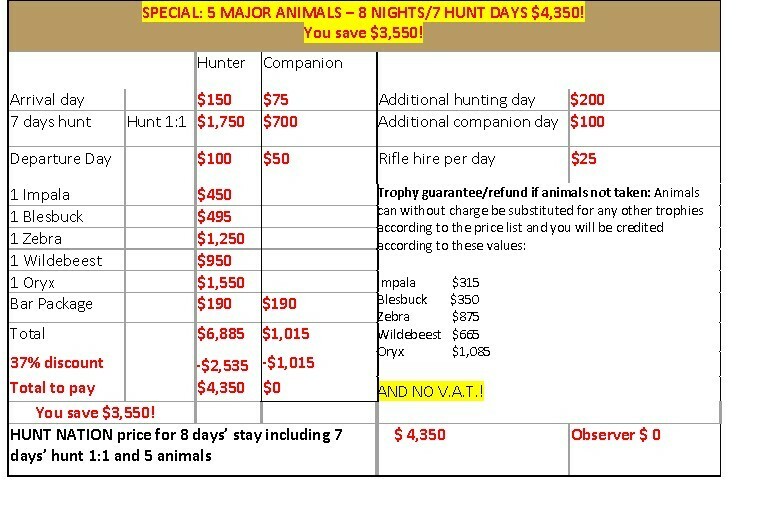 7 NIGHTS, 1 HUNTER, 1 OBSERVER, 1×1 HUNT, 3 ANIMALS $2,695 REALLY! Stay in a luxury 5 star lodge. Package includes your food, 1×1 guiding, your lodging and your companion and three trophy fees – all for only $2,695! Your only extras are tips or additional animals! And they even pick you up at the airport for free. You hunt nearly 500,000 acres in various concessions in the famed Limpopo Region. Normal price is $4,385, but we negotiated this incredible bargain for our clients. This is the ideal first-timer’s African safari at a truly ridiculous price. TWO PEOPLE GO TO AFRICA FOR JUST $2,625! THAT’S A 40% DISCOUNT. And add on more species from a long list of other animals. AND NO V.A.T.! ALL PACK AGES CAN BE ADDED TO OR MODIFIED. JUST ASK FOR A QUOTE! SHOOT AT LEAST 4 EXTRA TROPHIES BEYOND THOSE IN THE PACKAGE AT A TOTAL MINIMUM VALUE OF $3,000 AND GET A 10% DISCOUNT. 7-DAY/7 MAJOR ANIMALS SPECIAL PACKAGE FOR HUNT NATION CLIENTS: $7,650. SAVE $4,220! Includes Kudu, Gemsbok, Zebra, Wildebeest, Bushbuck, Blesbuck, Impala and Free Observer! AND NO V.A.T.! TROPHIES ARE MEASURED USING THE “SCI FIELD METHOD” AND ACCORDING TO PHASA (PROFESSIONAL HUNTERS’ ASSOCIATION OF SOUTH AFRICA) SCORE SHEET. • AND NO V.A.T.! THAT’S A 15% SAVINGS OVER MOST OTHER SOUTH AFRICAN OUTFITTERS! WE KNOW AND WE HUNT AFRICA!